Miller was arrested on the night of April 9, 2018 at LaGuardia Airport in Queens, New York on federal charges related to a fake bomb threat made while aboard an Amtrak train. According to a Department of Justice press release, he placed an emergency call on March 18, 2018, and reported that a female passenger had "a bomb in her bag" while traveling on Amtrak Train 2256 from Washington, D.C., toward Penn Station in New York City. After authorities evacuated passengers and searched Amtrak Train 2256, it turned out that Miller was actually on Amtrak Train 2258, which was also evacuated of passengers and searched. No evidence of any explosive device or materials was detected after officials stopped and inspected both trains. According to witnesses interviewed by Amtrak investigators, he appeared to be heavily intoxicated and involved, "in hostile exchanges with a woman who was sitting in a different row from him in the first-class car", and that he had been removed from the train prior to his intended stop due to his intoxication. On April 10, 2018, he was released on a $100,000 bond following an appearance at a federal court hearing in New Haven, Connecticut. If convicted, he could face up to five years in prison. In September 2018, it was reported that Miller was negotiating a plea deal to avoid a trial. As a result of this and the sexual assault allegations, Dreamworks removed Miller from How to Train Your Dragon: The Hidden World. The next hearing in the case has been rescheduled for August 1, 2019. ^ Naumann, Ryan (April 18, 2019). 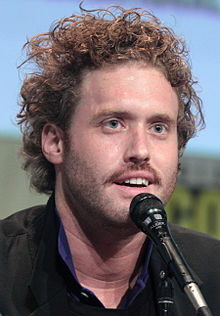 "'Deadpool' Star T.J. Miller Fears People Will Illegally Use His Signature, Prosecutors Seal Docs in Bomb Threat Case". The Blast. Retrieved April 21, 2019.